We are looking into the Events Calendar and Events Tickets. I was hoping someone could help me understand whether we need Events Tickets Plus or we can just use Events Tickets. From the Events Calendar, we would like people to “purchase” free tickets to our classes although it’s looking like we only have the option to set up the RSVP option as the set up stands right now. Is that because we aren’t using Plus? Also, we don’t want people to have to go through a check out process where they are asked for their credit card information when they are “purchasing” their tickets. Do we have the option to remove that step in the process? We’re looking into different solutions and The Events Calendar with Events Tickets comes very highly recommended. I just need those hopefully quick answers to decide how and whether or not to move forward. We’ll be glad to answer any question you might have. 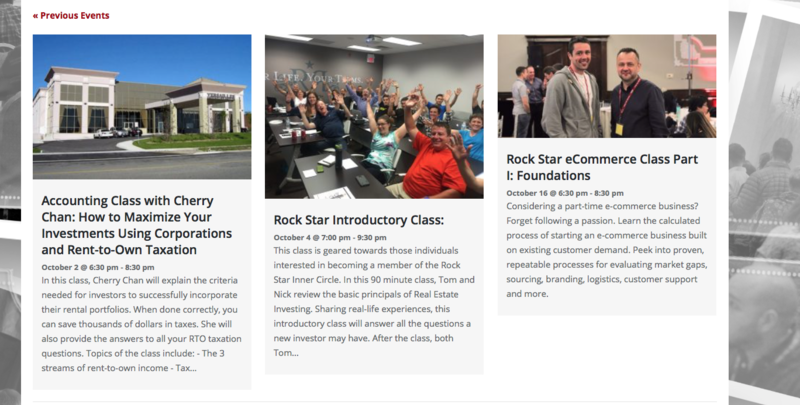 From the Events Calendar, we would like people to “purchase” free tickets to our classes although it’s looking like we only have the option to set up the RSVP option as the set up stands right now. Is that because we aren’t using Plus? Also, we don’t want people to have to go through a check out process where they are asked for their credit card information when they are “purchasing” their tickets. Do we have the option to remove that step in the process? 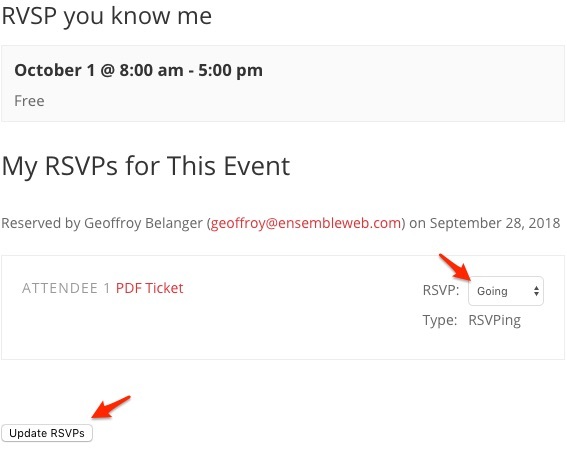 The way to skip that process is to use RSVP tickets while changing the RSVP label to something else. In other words, unless you need to capture custom attendee information (beyond name and email), you don’t need Event Tickets Plus. Event Tickets will suffice. I have a couple of set up questions. Can I ask them here too? 1. I see that I can set up the capacity for the event. Am I able to set a limit for how many people one person can register? Right now, if the room capacity is 30, I could RSVP for 30 people. I’d like to limit it that each person can book for themselves and a maximum of one guest. 2. How can people cancel for the event that they’ve registered for? Is there somewhere they can log in and cancel, is there a confirmation email they receive for the event containing a link to cancel? Will it cancel any guests they’ve registered as well? And if they do cancel, does it automatically update the availability for the class? 3. We would like to restrict how far out people can register for classes. We were hoping 3 months out, max. Is there a way we can set it up that they can still see the events (classes) but they can’t actually register for the class? Ideally, we’d like a message to pop up that says *sorry, registration is not available for this class, please check back 3 months prior to the class date* or something like that. But first, to be extra safe, before making any changes to your functions.php file, you should make a backup of that file. Yes, there is a place just for that. To have access to that functionality, you need to make sure users are logged-in. Images are worth a thousand words, so check out the 2 attached pictures. Login / WordPress management is a whole different subject. Users will need at least a basic WordPress user level (e.g. : subscriber) to log in. You can keep things nice and tidy by using something like https://wordpress.org/plugins/theme-my-login/ to do that. Yes, you can manage that by setting the “sale start date” of the RSVP ticket. 1. I added the code to my functions page and altered it a bit to say 2, instead of 1. (see code below) I’m not able to change the quantity to a max of 2 which is good, but it is not adding more than one set of contact info to populate (Image attached). How can I alter the code so that it’s asking for contact info for their guest too? 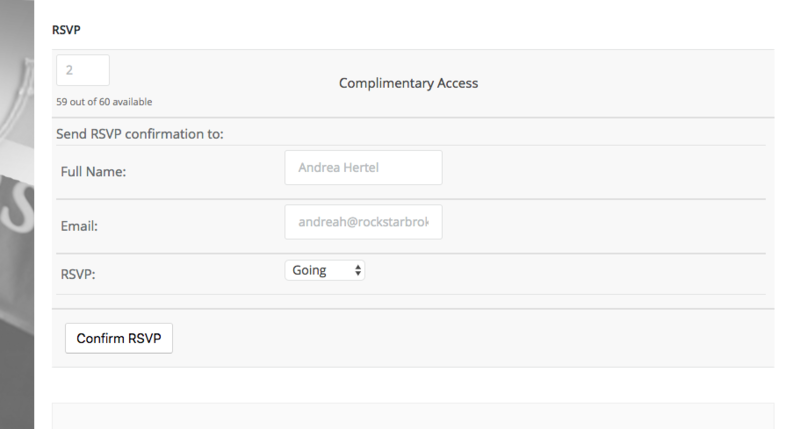 Also, I believe for the guest we’ll only need the name… can I change the required fields for the second person? 2. Ok perfect. Our site is password protected anyway so they will be logged in. 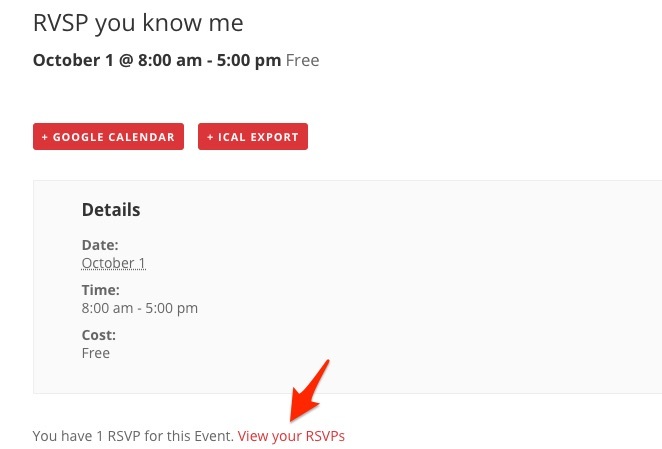 Is there anywhere else they can see that they have rsvps, or just if they click into the event they’re registered for? I will be happy to answer your follow-up questions. That is actually a limitation of RSVP tickets: it only asks the info of the person making the “reservation”. That said, we have built our plugins in a way to enable customization. If coding is not really your cup of tea, you could always hire one of our recommended customizers to do the customization for you. Just to set expectations, the scope of our support is mostly to get our customers started on the right track and to help them in case of issues. We, unfortunately, do not provide complete support for customization. Attendee information can be captured for all types of tickets: RSVP, Tribe Commerce, Full Ecommerce (e.g. : WooCommerce). This is where “normal” tickets have an edge since most Ecommerce platforms will let you see your purchases (in this case tickets). That said, we have a handful of snippets that can help to get you started. The first thing I would recommend is to try using the “Excerpt” field from your Edit event page (as opposed to letting WordPress decide where the text cuts). As for the second part of your question, you can pretty much customize any view to your liking. You might want to read our Themer’s guide to get a sense of how that works. Here is an example of a pretty awesome customization of the photo view (for inspiration). I’ll read through everything and see what I can come up with. I have access to someone who is WAY more tech-savvy than I am (thank goodness) so I’ll see if he can help me out with anything I can’t figure out. You had said “Here is an example of a pretty awesome customization of the photo view (for inspiration).” but you didn’t include anything after that. Hopefully, with that information and your computer-savvy friend, you will be able to achieve what you are looking for! You are right. I totally forgot to send the link. The topic ‘Which Product Do I Need’ is closed to new replies.